Tightness in the chest can be a scary feeling because it is most often associated with conditions like heart attack or stroke. Did you know tightness in the chest can also be a symptom of anxiety and panic attacks? Anxiety disorders are the most common mental illness in America, affecting 40 million adults. Most anxiety disorders are treatable, but only about 1/3 of sufferers receive treatment. If you are suffering from tightness in the chest and believe it is due to anxiety, visit one of FastMed’s walk-in clinics. Our mission is to provide our patients with high-quality, compassionate care at a cost that is affordable. How Do I Know if the Tightness in My Chest Is Caused by Anxiety? One of the best ways to tell if you are suffering from anxiety-related chest tightness is to rule out heart and lung conditions. A visit to your healthcare provider is the first step in determining whether the tightness in your chest is caused by anxiety or something else. 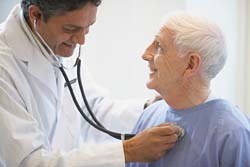 There are a few key signs that you can check before seeking the guidance of a medical professional. Practicing these techniques can help you temporarily reduce your anxiety. Still, anxiety is often caused by a disorder and should be diagnosed and treated by a medical professional. If you are suffering from anxiety-related chest tightness, FastMed Urgent Care can provide you with immediate treatment. If a medical professional at FastMed determines you need treatment from a specialist, we can set up the appointment for you and send your medical records to their office.